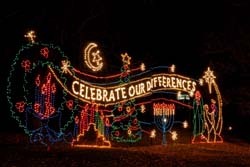 Holiday outdoor lighting displays are no longer reserved for Christmas time only. There are plenty of other times in the year to celebrate your holiday spirit. Since different holidays are celebrated in different parts of the world, we will discuss only some of them here. Lets look at how holiday lighting can make your outdoor lighting displays more festive. Animated holiday lights are a fun way to dress up your home. Combine festive holiday lights with animated outdoor rope lighting character displays or lawn ornaments. Rope lighting character displays are pre-assembled so all you need to do is set them up and plug them in. The character's rope lights are timed just right to create the illusion that they're moving. You may also be familiar with motorized string lighting lawn ornaments. These string lights are wrapped around a metal frame usually in the form of a holiday figure. When lit, the motorized metal frame makes the lawn ornaments come to life with movement. During the holidays many municipalities will use holiday outdoor lighting to dress up the town for the holiday season. You'll often see telephone poles decorated with Christmas decorations of some sort. If you have a pole you'd like to decorate, look for outdoor pole mounting kits. These mounting kits allow you to add your own holiday lighting display onto any pole you wish. Christmas is the biggest holiday of the year at least in the U.S. Its also a popular time for holiday outdoor lighting displays. Most people are familiar with outdoor Christmas lighting technologies since they haven't changed all that much over the years. The most common type, outdoor string lighting is most commonly seen outside of homes around the holidays. More recently, outdoor led lighting has made a big impact on the Christmas lighting scene. These lights are not only brighter than traditional incandecent lights, but they last much longer. Halloween is another very popular U.S. holiday for outdoor lighting fun. Spooky holiday lighting decorations set the mood for a fun halloween experience that'll be enjoyed by both kids and adults. Jack o lanterns are one of the most common types of halloween ornaments you can find. Jack o lantern lights are much safer and cleaner than candles, especially if you have kids. Look for halloween rope lights that come pre-assembled in the shape of figures such as a pumpkin, witch, or other fun halloween figure. Simply position these ornaments in their place and plug them in and you're done. Create dramatic effects that make your spooky outdoor decorations come to life with halloween stobe lights. The flash these strobe lights emit mimick that of lightning. Use stake mounted outdoor lighting fixtures to draw attention to the spooky yard decorations you've spent so much time preparing. Add color filters to those lights to create a more dramatic effect. Moon lighting can add a subtle hint of light on your halloween display. Find out how outdoor tree lighting can help you create this lighting effect. We all love a spectacular fireworks display with all the beautiful colors and heart pounding explosions. It takes us back to those special times we shared with our family when we were kids. Create a colorful display of your own with holiday outdoor lighting that shows off your patriotic colors at the same time. Animated rope lighting displays add color to your outdoor display and help you carry on the independence day theme just the same. Mardi gras is one of the biggest outdoor parties I know of because it is celebrated in so many different parts of the world. The vivid colors, provocative costumes, and fun floats makes this event something to look forward to each year. If you're lucky enough to live in an area that celebrates mardi gras, you'll want to get your hands on all the colorful holiday lights you can find.